WestSide Corporation Limited (ASX:WCL) (OTCMKTS:WBRIF) announces a number of changes to the Company&apos;s Board following the recent successful takeover by Landbridge Energy Australia Pty Ltd.
WestSide Corporation Limited (ASX:WCL) (OTCMKTS:WBRIF) Quarterly Activities Report for the period ending June 2014, including the Landbridge Takeover, overview and outlook as well as sales for the period. WestSide Corporation Limited (ASX:WCL) (OTCMKTS:WBRIF) advises ASX that the WestSide Board has exercised its discretion in accordance with the WestSide Employee Performance Rights Plan to vest all outstanding Employee Performance Rights and release holding locks on all unquoted employee shares. WestSide will apply to ASX for the quotation of these Ordinary Shares. WestSide Corporation Limited (ASX:WCL) (OTCMKTS:WBRIF) refers to the announcement on 4 July 2014 by Landbridge Energy Australia Pty Ltd that it now has a relevant interest of 31.04% in WestSide. WestSide understands that this most recent increase in Landbridge&apos;s shareholding is, in part, a result of its acquisition of WestSide shares from WestSide&apos;s second largest shareholder, New Hope Corporation. WestSide Corporation Limited (ASX:WCL) (OTCMKTS:WBRIF) advises that the first new lateral production well in the current Phase 1 well program has been successfully drilled at the Meridian gas field and is expected to be on line by the end of July. In accordance with Listing Rule 3.10.7, WestSide Corporation Limited (ASX:WCL) (OTCMKTS:WBRIF) wishes to advise that 1,700,000 Employee Performance Rights held by WestSide&apos;s Managing Director&apos;s nominee automatically became exercisable as a result of Landbridge Energy Australia Pty Ltd declaring its off-market takeover bid for WestSide unconditional. WestSide Corporation Limited (ASX:WCL) (OTCMKTS:WBRIF) has today received notification that Landbridge Group Co., Ltd has declared its offer unconditional and offer price final (in the absence of a higher offer). WestSide Corporation Limited (ASX:WCL) (OTCMKTS:WBRIF) is assessing funding proposals and indicative term sheets received from several potential lenders to finance an expansion of the Meridian gas field near Moura in central Queensland. Chairman from Westside Corporation Limited (ASX:WCL) (OTCMKTS:WBRIF) provides an announcement regarding the extension of Landbridge&apos;s takeover offer. WestSide Corporation Limited (ASX:WCL) (OTCMKTS:WBRIF) (WestSide) refers to the conditional offer announced on 24 April 2014 by Landbridge Energy Australia Pty Ltd (Landbridge) to acquire all of the Shares in WestSide. WestSide Corporation Limited (ASX:WCL) (OTCMKTS:WBRIF) presents their latest investor update: Growth plans on track. WestSide Corporation Limited (ASX:WCL) (OTCMKTS:WBRIF) advises that plans for further expansion of the Meridian gas field&apos;s production capacity are on track following execution of the Company&apos;s transformational Gas Sale Agreement with GLNG. Westside Corporation Limited&apos;s (ASX:WCL) (OTCMKTS:WBRIF) board of directors has carefully considered the conditional offer for $0.40 per WestSide share contained in the Bidder&apos;s Statement lodged with ASX by Landbridge on 24 April and is of the view that it does not represent fair value for the Company as, amongst other things, it does not take adequate account of the value anticipated to accrue to WestSide on the terms of the recently announced GSA with the GLNG consortium. WestSide Corporation Limited&apos;s (ASX:WCL) (OTCMKTS:WBRIF) board of directors has carefully considered the conditional offer for $0.40 per WestSide share contained in the Bidder&apos;s Statement and is of the view that it does not represent fair value for the Company. WestSide Corporation Limited (ASX:WCL) (OTCMKTS:WBRIF) is pleased to advise that a contract to sell the Company&apos;s Schramm drilling rig has settled following receipt of a total consideration of $3.5 million. The Board of WestSide Corporation Limited ("WestSide") (ASX:WCL) has extended the share trading "closed period" for key management personnel (including Directors) and employees until the time that the Company&apos;s Target&apos;s Statement is issued in response to the conditional takeover offer from Landbridge Energy Australia Pty Ltd (Landbridge), a wholly owned subsidiary of Landbridge Group Co., Ltd.
Landbridge Energy Australia Pty Ltd (Landbridge), a wholly owned subsidiary of Landbridge Group Co., Ltd delivered a Bidder&apos;s Statement to WestSide Corporation Limited (ASX:WCL) (OTCMKTS:WBRIF) following the close of the market on Thursday 24 April 2014. WestSide Corporation Limited (ASX:WCL) (OTCMKTS:WBRIF), a unique company with producing assets, a binding gas sale agreement and significant additional uncommitted reserves. As Operator of the Meridian gas fields near Moura in Queensland&apos;s southern Bowen Basin, WestSide Corporation Ltd (ASX:WCL)(OTCMKTS:WBRIF) is pleased to advise that the first phase of the field&apos;s expansion is on track to start within one month when drilling commences on the first well of a six-well program. WestSide Corporation Limited (ASX:WCL) has received notification that Landbridge Energy Australia Pty Ltd has acquired 14,264,365 WestSide shares off-market at $0.32 per share, constituting approximately 3.2% of WestSide&apos;s issued share capital. Attached is a copy of a letter being sent to WestSide Corporation Limited (ASX:WCL) (OTCMKTS:WBRIF) shareholders in connection with the approach by Chinese company Landbridge Group Co., Ltd announced on 10 March 2014 and WestSide&apos;s subsequent execution of a gas sales agreement with GLNG announced on 27 March 2014. 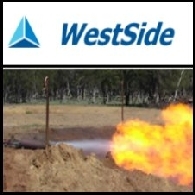 WestSide Corporation Limited (ASX:WCL) (OTCMKTS:WBRIF) Open Briefing - MD Mike Hughes on GLNG Gas Sales Agreement. Record of interview. 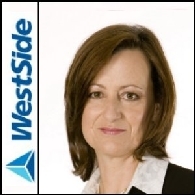 WestSide Corporation Limited (ASX:WCL) Westside investor and media briefing details. Copies of WestSide’s announcement and the investor presentation have been released to the ASX this morning and are also available from the Company’s website. 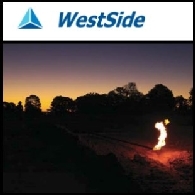 WestSide Corporation Limited (ASX:WCL) is pleased to announce that the Meridian joint venture has signed a binding 20-year agreement to sell gas to the GLNG project, with market pricing based on an oil-linked formula. WestSide Corporation Ltd (ASX:WCL) has notified the Queensland Department of Natural Resources and Mines that it will relinquish its interests in ATP 974P and ATP 978P in Queensland&apos;s Galilee Basin to focus on development of its producing Meridian SeamGas gas field. Revenue from continuing operations for the six months to 31 December 2013 was $5.0 million (2012: $4.7m), including $4.0 million from Meridian SeamGas operations (2012: $4.0m) and $0.3 million in interest income (2012: $0.6m). WestSide Corporation Limited (ASX:WCL) reported an operating loss for the six months to 31 December 2013 of $5.65 million, consistent with the $5.62 million loss reported for the previous corresponding period. The Board of WestSide Corporation Limited (ASX:WCL) has extended the share trading &apos;closed period&apos; for key management personnel (including Directors) and employees until the time that the Company&apos;s March quarter Activities Report is issued (expected to be late April). Landbridge Group Co., Ltd ("Landbridge"), a company based in Shandong Province, China, has today announced that it conditionally intends to make an unsolicited off market takeover bid for all of the shares in WestSide Corporation Limited (ASX:WCL) for cash consideration of $0.36 per share ("Intended Bid"). WestSide Corporation Limited (ASX:WCL) announces the Company update presentation. 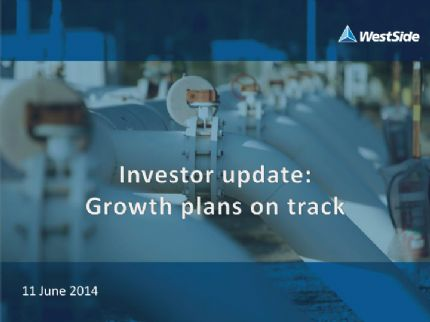 During the quarter Westside (ASX:WCL) maintained its sharp operating focus on production. Sales from the Meridian eld (excluding fuel gas) were up a further 5% on the prior September quarter at 1,064,468 GJ (542,879 GJ net to WestSide) or 11.6 TJ/d. WestSide Corporation Limited (ASX:WCL) is delighted to announce the appointment of Bryan O&apos;Donnell as Development Manager. In this role Bryan&apos;s key focus will be to manage the forthcoming development of the Meridian gas field. WestSide Corporation Limited (ASX:WCL) announces the Company Update for November 2013. Westside is an ASX-listed gas Producer & Explorer, and the following highlights form part of the presentation. Meridian SeamGas gas field operator, WestSide Corporation Ltd (ASX:WCL), is pleased to announce that its Share Purchase Plan has closed heavily oversubscribed and has raised A$7.45 million. WestSide Corporation Limited (ASX:WCL) is pleased to advise that the Board has appointed Mr Robert Neale as Chairman and Mr Mike Hughes as Managing Director of the Company, effective immediately. 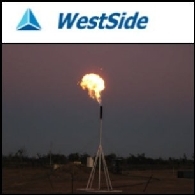 WestSide Corporation Limited (ASX:WCL) report the September quarter Meridian gas sales revenue net to WestSide of $1.9 million up 12 % on the June quarter. Funds raised under the SPP will be used to fund WestSide&apos;s operations for the financial year ended 30 June 2014 while the Company seeks to secure new gas supply agreements and finalise associated field development plans. WestSide Corporation Limited (ASX:WCL) (WestSide) today announces that WestSide has successfully completed a private placement to institutional and sophisticated investors of new fully paid ordinary shares at A$0.18 per share to raise A$8 million (Placement); and will offer eligible shareholders the opportunity to subscribe for shares at the same issue price of A$0.18 per share through a share purchase plan (SPP) targeting an additional A$2 million. The Board of dedicated Coal Seam Gas (CSG) producer WestSide Corporation Ltd (ASX:WCL) is pleased to announce the appointment of international oil and gas sector executive Mike Hughes as CEO to lead the Company during its next exciting growth phase. WestSide Corporation Limited (ASX:WCL) advises that the Company&apos;s 2013 Annual General Meeting will be held on Monday, 25 November 2013, at UQ Business School Downtown, Central Plaza 1, Level 19, 345 Queen Street, Brisbane. WestSide Corporation Ltd (ASX:WCL) (OTCMKTS:WBRIF) advises that the Thisit 01 exploration well will be plugged and abandoned before reaching its planned total depth due to hole instability. 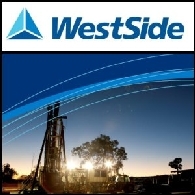 WestSide Corporation Limited (ASX:WCL) today advises that it expects to report a loss of $21.9 million for FY2013 after taking write downs totalling $8.9 million against the carrying values of the Company&apos;s Galilee Basin exploration interests and its drilling rig. WestSide Corporation Ltd (ASX:WCL) is pleased to advise that drilling has commenced on the Thisit 01 exploration well 18km north west of Moura. As Operator of the Meridian SeamGas CSG gas field, WestSide Corporation Ltd (ASX:WCL) is pleased to advise August gas sales have averaged 11.1 Terajoules a day (TJ/d) month to date - up 22 per cent from a low in May 2013. WestSide Corporation Limited (ASX:WCL) has undertaken a strategic review of the business following the withdrawal of PetroChina International Investment Company Limited&apos;s (PetroChina) non-binding proposal to acquire 100 per cent of the Company. WestSide Corporation Limited (ASX:WCL) has been advised by PetroChina International Investment Company Limited (PetroChina), which submitted an indicative, non-binding proposal to acquire 100 per cent of the shares in WestSide on 19 November 2012, that it will not proceed with the proposal. During the March quarter WestSide Corporation Limited (ASX:WCL) engaged with independent certifer MHA Petroleum Consultants LLC to deliver another substantial increase in the Company&apos;s net certifed reserves across all categories including a 34.5% increase in Proved and Probable (2P) reserves to 347 PJ. During the March quarter WestSide Corporation Limited (ASX:WCL) engaged with independent certifier MHA Petroleum Consultants LLC to deliver another substantial increase in the Company&apos;s net certified reserves across all categories including a 34.5% increase in Proved and Probable (2P) reserves to 347 PJ(1). WestSide Corporation Limited (ASX:WCL) advises that discussions are continuing with parties which have expressed an interest in entering into material transactions with the company, including the potential acquisition of 100% of the shares in WestSide. WestSide Corporation Limited (ASX:WCL) is pleased to announce a significant upgrade to its certified reserves after receiving a new reserves report on the Meridian SeamGas CSG gas field near Moura in Queensland&apos;s Bowen Basin. 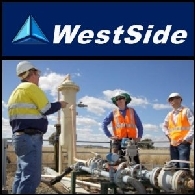 WestSide Corporation Limited (ASX:WCL) advises that it is continuing to progress discussions with the party which submitted an indicative, conditional, non-binding and confidential proposal on 19 November 2012. WestSide Corporation Limited (ASX:WCL) advises that the party from which the Company received an indicative, conditional, non-binding and confidential proposal on 19 November 2012, has requested and been granted additional time to conclude due diligence. 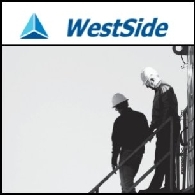 WestSide Corporation Limited (ASX:WCL) are pleased to provide the CEO&apos;s Presentation at the Annual General Meeting 2012. WestSide Corporation Limited (ASX:WCL) are pleased to provide the Chairman&apos;s Address to Shareholders at the Annual General Meeting 2012. WestSide Corporation Limited (ASX:WCL) has received an indicative, conditional, non-binding and confidential proposal from a party which has conducted extensive due diligence on the Company. WestSide Corporation Limited (ASX:WCL) are pleased to provide a Shareholder Newsletter - September Quarter Actvities Report. WestSide Corporation Limited (ASX:WCL) are pleased to provide a Company Presentation - RBS Morgans 2012 Queensland Conference. The presentation includes, WestSide at a glance; Asset Location; Market Outlook for Meridian SeamGas; the Indicative Takeover Approach; WestSide&apos;s Reserves Position as well as an Operations Overview. As Operator of the Meridian SeamGas CSG gas fields, WestSide Corporation Ltd (ASX:WCL) is pleased to advise that drilling has commenced on the first of a series of new wells to increase production toward an initial target of 25 Terajoules a day. WestSide Corporation Limited (ASX:WCL) are pleased to provide the Noosa Mining and Exploration Conference 2012 presentation. WestSide identifies, commercialises and maximises the value of existing and new gas reserves to provide innovative energy outcomes in a sustainable manner for the benefit of all stakeholders. WestSide Corporation Ltd (ASX:WCL) is pleased to advise that Meridian SeamGas achieved average daily gas sales during June of 13.5 TJ/d - up 53.4 per cent on the average for June last year - with a second new dual-lateral well now flowing at more than 1 million scf/d. WestSide Corporation Limited (ASX:WCL) advises that due diligence investigations are continuing in relation to the indicative and conditional acquisition proposal received from Liquefied Natural Gas Limited ("LNG Limited") (ASX:LNG) in February 2012. WestSide Corporation Ltd (ASX:WCL) is pleased to advise that Meridian SeamGas achieved average daily gas sales during May of 11.7 TJ/d, up 32.8 per cent on the average for May last year, as new wells continued ramping up and work overs delivered results. 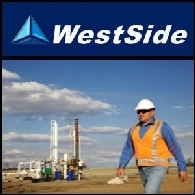 WestSide Corporation Limited (ASX:WCL) is pleased to provide a Quarterly Activities Report for the period ended 31 March 2012. 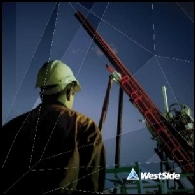 WestSide Corporation Limited (ASX:WCL) is pleased to provide its Quarterly Activity Report for the quarter ended 31 March 2012. WestSide Corporation Limited (ASX:WCL) is pleased to provide a presentation regarding the RBS Morgans Unconventional Oil &Gas Day. WestSide Corporation Limited (ASX:WCL) is pleased to advise that March quarter production at Meridian SeamGas was up 10.6 per cent on the December quarter as new Meridian wells continued ramping up and work overs showed results. WestSide Corporation Limited (ASX:WCL) is pleased to announce that the Company&apos;s fully-underwritten, 2-for-5 pro rata non-renounceable Entitlement Offer and Top Up Facility ("Offer") at A$0.25 per share, raising $25.4 million, has closed well oversubscribed. 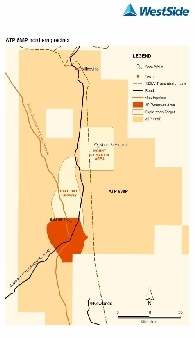 As Operator of the Meridian SeamGas CSG gas fields, WestSide Corporation Limited (ASX:WCL) advises that the Meridian SeamGas joint venture and the owners of the adjacent Dawson coal mine (the "Coal Party") have signed an agreement to optimise management of five well-sets located within a co-development area of the mining lease. Following release of the Offer Booklet to ASX this morning, please find attached copies of the following ancillary documents relating toWestSide Corporation Limited&apos;s (ASX:WCL) entitlement offer ("Offer") announced on 8 March, 2012. As Operator of the Meridian SeamGas CSG gas fields, WestSide Corporation Limited (ASX:WCL) is pleased to advise that gas has been flowing from Pretty Plains 10 - one of seven new dual-lateral production wells - at a rate of more than 1,000,000 scf/d. On 8 March 2012 WestSide Corporation Limited (ASX:WCL) announced a non-renounceable pro rata entitlement offer to raise approximately A$25.4 million ("Offer"). Eligible WestSide shareholders will be entitled to subscribe for 2 new fully paid ordinary shares in WestSide ("New Shares") for every 5 WestSide ordinary shares they hold for an issue price of A$0.25 per New Share. WestSide Corporation Limited (ASX:WCL) are pleased to provide an investor presentation - 2 for 5 Entitlement Offer. WestSide Corporation Limited (ASX:WCL) today announces a 2-for-5 pro rata entitlement offer to shareholders at A$0.25 per new share to raise approximately A$25.4 million for working capital to meet its near-term growth aspirations across its various operations in Queensland. WestSide Corporation Limited (ASX:WCL) has been monitoring media speculation and commentary regarding the identity of the unrelated party referred to in the Company&apos;s ASX announcement on 13 February 2012: Notification of Approach. WestSide Corporation Limited (ASX:WCL) Open Briefing - Reserves Upgrade and December Quarter 2011. In this Open Briefing Julie Discusses; Reserves Upgrade, Initiatives in place to support production ramp up, Implications of recently signed gas swap agreement and outlook for production and exploration in 2012. WestSide Corporation Limited (ASX:WCL) is pleased to announce a significant upgrade to total Proved, Probable and Possible reserves (3P), after receiving a new reserves report on the Meridian SeamGas gas fields near Moura in Queensland&apos;s Bowen Basin. 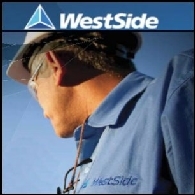 WestSide Corporation Limited (ASX:WCL) is pleased to provide a quarterly activities report for the period ended 31 December 2011. WestSide Corporation Limited (ASX:WCL) and Meridian SeamGas joint venture partner Mitsui E&P Australia Pty Ltd (Mitsui) have today executed an agreement to fast-track access to gas to aid fulfilment of existing contracts and reduce payments to remedy shortfalls. WestSide Corporation Ltd (ASX:WCL) advises that Galilee Basin exploration well Glenlyon 2, within ATP 974P in north western Queensland, has been drilled to 1,222 metres and intersected in excess of 10.8 metres of gross coal measured. WestSide Corporation Limited (ASX:WCL) is pleased to release the Chairman&apos;s Address to Shareholders at 2011 Annual General Meeting. As Operator of the Meridian SeamGas CSG gas fields, WestSide Corporation Limited (ASX:WCL) is pleased to advise that a second new dual-lateral production well has joined the ranks of the top producers with the gas flow rate from Pretty Plains 10 exceeding 800,000 scf/d. WestSide Corporation Limited (ASX:WCL) advises that Galilee Basin exploration well Glenlyon 2, within ATP 974P in north western Queensland, has spudded. As Operator of the Meridian SeamGas CSG gas fields WestSide Corporation Limited (ASX:WCL) is pleased to advise that one of the joint venture&apos;s seven new dual-lateral production well sets has become a top producer. WestSide Corporation Limited (ASX:WCL) is pleased to advise that the Company&apos;s Galilee Basin exploration program has commenced with the spudding of the Glenlyon 1 exploration well within ATP 974P in north western Queensland. 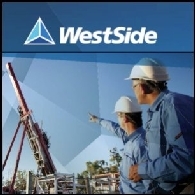 WestSide Corporation Limited (ASX:WCL) has exited its Indonesian joint venture, enabling the Company to focus exclusively on its Meridian SeamGas and Bowen and Galilee Basin projects in Queensland. WestSide Corporation Limited (ASX:WCL) is focused on coal seam gas exploration and production in Queensland with assets including a 51% operating stake in the producing Meridian SeamGas field in the Bowen Basin. WestSide Corporation Limited (ASX:WCL) and Queensland Gas Company have today executed a restructure of the Joint Operating Agreements covering their coal seam gas exploration tenements ATP 688P and ATP 769P in Queensland&apos;s Bowen Basin. As Operator of the Meridian SeamGas CSG gas fields, WestSide Corporation Ltd (ASX:WCL) is pleased to advise the drilling of the MER09X exploration well has been completed, ending the first phase of the Meridian SeamGas reserves expansion exploration program. As Operator of the Meridian SeamGas CSG gas fields, WestSide Corporation Limited (ASX:WCL) is pleased to advise that drilling has commenced on the MER09X exploration well in PL 94 near Moura - maintaining the current reserve expansion program&apos;s momentum. As Operator of the Meridian SeamGas CSG gas fields, WestSide Corporation Ltd (ASX:WCL) is pleased to advise that drilling has commenced on the MER05X exploration well in PL 94 near Moura - maintaining the current reserve expansion program&apos;s momentum. Meridian SeamGas operator WestSide Corporation Limited (ASX:WCL) is pleased to announce a 30 per cent increase in total Proved, Probable and Possible (3P) reserves attributable to the joint venture when the Company assumed operatorship on 1 July last year. As Operator of the Meridian SeamGas CSG gas fields, WestSide Corporation Limited (ASX:WCL) is pleased to advise that drilling has commenced on the MER14X exploration well in PL 94 near Moura - maintaining the current reserve expansion program&apos;s momentum. WestSide Corporation Limited (ASX:WCL) has received a notice of intention from Mitsui E&P Australia Pty Ltd (Mitsui) to exercise its options to acquire 49 per cent of the Company&apos;s 50 per cent interests in Bowen Basin tenements ATP 688P and ATP 769P. WestSide Corporation Limited (ASX:WCL) has agreed to a short, six-day extension of Mitsui E&P Australia Pty Ltd&apos;s (Mitsui) deadline to exercise its options to acquire 49 per cent of the Company&apos;s 50 per cent interests in Bowen Basin tenements ATP 688P and ATP 769P. As Operator of the Meridian SeamGas CSG gas fields, WestSide Corporation Ltd (ASX:WCL) is pleased to advise that drilling has commenced on the MER11VR appraisal well in PL 94 near Moura - maintaining the current reserve expansion program&apos;s momentum. As Operator of the Meridian SeamGas CSG gas fields, WestSide Corporation Limited (ASX:WCL) is pleased to advise that drilling has commenced on the MER03V exploration well in PL 94 near Moura - maintaining the current reserve expansion program&apos;s momentum. As Operator of the Meridian SeamGas CSG gas fields, WestSide Corporation Ltd (ASX:WCL) advise that drilling has commenced on the MER03X exploration well in PL 94 near Moura - maintaining the current reserve expansion program&apos;s momentum. As Operator of the Meridian SeamGas CSG gas fields, WestSide Corporation Ltd (ASX:WCL) is pleased to advise that drilling has commenced on the MER11V pilot production well in PL 94 in the Bowen Basin near Moura. As Operator of the Meridian SeamGas CSG gas fields, WestSide Corporation Ltd (ASX:WCL) is pleased to advise that drilling of the MER08V pilot production well in PL 94 near Moura in the Bowen Basin has commenced. As Operator of the Meridian SeamGas CSG gas fields, WestSide Corporation Limited (ASX:WCL) advise that drilling of the MER02V pilot production well in PL 94 near Moura in the Bowen Basin commenced yesterday. As Operator of the Meridian SeamGas Coal Seam Gas gasfields, WestSide Corporation Limited (ASX:WCL) is pleased to advise production activities at the joint venture&apos;s Bowen Basin operations near Moura have experienced only minor impacts to date from recent regional flooding and wet weather. WestSide Corporation Limited (ASX:WCL), as Operator of the Meridian SeamGas CSG gas fields, has completed drilling the MER01V pilot production well in PL 94 in the Bowen Basin near Moura after successfully drilling the adjacent MER01X appraisal well. As Operator of the Meridian SeamGas CSG gas fields, WestSide Corporation Ltd (ASX:WCL) has commenced drilling the MER01V pilot production well in PL 94 in the Bowen Basin near Moura after successfully drilling the adjacent MER01X appraisal well. 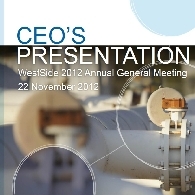 WestSide Corporation Limited (ASX:WCL) is pleased to release the Chairman Address to the 2010 Annual General Meeting. WestSide Corporation Limited (ASX:WCL) and Meridian SeamGas joint venture partner Mitsui E&P Australia Pty Ltd (MEPAU) will today commence drilling the MER01X exploration well - the first under a A$17 million reserves expansion program. WestSide Corporation Limited (ASX:WCL) has received a notice of intention from Mitsui E&P Australia Pty Ltd (Mitsui) to exercise its farm-in option to acquire a 49 per cent interest in each of the Company&apos;s Galilee Basin tenements, ATP 974P and ATP 978P. WestSide Corporation Limited (ASX:WCL) and Meridian SeamGas joint venture partner Mitsui E&P Australia Pty Ltd (MEPAU) have started drilling the second of a series of well-sets under the A$14.5 million first stage of a work program to lift field production and increase reserves. WestSide Corporation Limited (ASX:WCL) and Meridian SeamGas joint venture partner Mitsui E&P Australia Pty Ltd (MEPAU) have begun rolling out the A$14.5 million first stage of a field development program to lift production and expand reserves. WestSide Corporation Ltd (ASX:WCL) has now completed drilling three new appraisal wells at its Paranui CSG pilot in ATP 769P near Moura in Queensland&apos;s Bowen Basin. The Paranui #13 well is the last of the three appraisal wells which will aim to test gas and water flow rates from the Baralaba coal seams. WestSide Corporation Limited (ASX:WCL) has secured a significant foothold in Queensland&apos;s coal-rich Galilee Basin with the Queensland Government formally granting two petroleum exploration tenements. Leading dedicated Coal Seam Gas (CSG) producer WestSide Corporation Ltd (ASX:WCL) has appointed a new Chief Executive Officer following the completion of its major Bowen Basin joint venture acquisition. WestSide Corporation Limited (ASX:WCL) is drilling three new appraisal wells at its Paranui CSG pilot in ATP 769P near Moura in Queensland&apos;s Bowen Basin. The Paranui #13 well is the last of the three appraisal wells which will aim to test gas and water flow rates from the Baralaba coal seams. WestSide Corporation Limited (ASX:WCL) has finalised the purchase of 51 per cent interest in the Dawson coal seam gas (CSG) fields in Queensland with A$26.8 million. Westside said the company and joint venture partner Mitsui E&P Australia Pty Ltd (MEPAU), which owns the remaining 49 per cent in the CSG fields, have emerged as a new force in Queensland coal seam gas. WestSide Corporation Limited (ASX:WCL) is drilling three new appraisal wells at its Paranui CSG pilot in ATP 769P near Moura in Queensland&apos;s Bowen Basin. The Paranui #12 well is the second of three appraisal wells which will aim to test gas and water flow rates from the Baralaba coal seams. WestSide Corporation Limited (ASX:WCL) and joint venture partner Mitsui E&P Australia Pty Ltd (MEPAU) have emerged as a new force in Queensland coal seam gas (CSG) after today finalising their acquisition of the Dawson CSG fields. WestSide Corporation Limited (ASX:WCL) is close to completing the A$26.8 million joint venture acquisition that will transform it from explorer to coal seam gas producer and operator. WestSide Corporation Limited (ASX:WCL) is drilling up to three new appraisal wells at its Paranui CSG pilot in ATP 769P near Moura in Queensland&apos;s Bowen Basin. The Paranui #12 well is the second of three appraisal wells which will aim to test gas and water flow rates from the Baralaba coal seams. WestSide Corporation Limited (ASX:WCL) is drilling up to three new appraisal wells at its Paranui coal seam gas (CSG) pilot in ATP 769P near Moura in Queensland&apos;s Bowen Basin. WestSide Corporation Ltd (ASX:WCL) has commenced the expansion of its Paranui coal seam gas (CSG) pilot in ATP 769P near Moura in Queensland&apos;s Bowen Basin, with the spud of the Paranui #11 appraisal well. The Paranui #11 well is the first of three appraisal wells which will aim to test gas and water flow rates from the Baralaba coal seams. WestSide Corporation Limited (ASX:WCL) has agreed to expand its alliance with Mitsui E&P Australia Pty Ltd (Mitsui) to potentially include the Company&apos;s coal seam gas (CSG) interests in ATP 688P in Queensland&apos;s northern Bowen Basin. WestSide Corporation Limited (ASX:WCL) is pleased to announce the appointment of Mr Robert Neale and Mr John Clarke as Non-executive Directors as the Company prepares to embark on an exciting new growth phase. WestSide Corporation Limited (ASX:WCL) is currently drilling the final well of a seven well campaign in its northern Bowen Basin coal seam gas (CSG) exploration tenements. WestSide Corporation Limited (ASX:WCL) continues drilling operations in its Bowen Basin coal seam gas (CSG) exploration tenements. WestSide Corporation Limited (ASX:WCL) will draw on the Wood Group&apos;s (LON:WG) international coal seam gas (CSG) expertise by appointing Wood Group Wagners (WGW) to operate, maintain, manage and support WestSide&apos;s Schramm TXD &apos;Telemast&apos; drilling rig. WestSide Corporation Limited (ASX:WCL) continues drilling operations in its Bowen Basin coal seam gas (CSG) exploration tenements. Current activities are focussed on WestSide&apos;s Mount Saint Martin prospect in ATP 688P. Five wells have been drilled this year, leaving one to complete the program. The wells will test the extent of the resource previously identified at Mount Saint Martin. 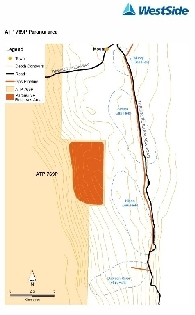 Core wells Mount Leslie #8 and Exmoor #9 will target the gas potential of new precincts in ATP 688P. WestSide Corporation Limited (ASX:WCL) advises that it has successfully completed its capital raising program following the close of its 1-for-1 non-renounceable pro-rata entitlements issue at an issue price of A$0.45 (Offer) on Monday 10 May. WestSide Corporation Limited (ASX:WCL) releases an operational report. WestSide Corporation Limited (ASX:WCL) is pleased to provide a Quarterly Activities Report for the period ending 31 March 2010. WestSide Corporation Ltd (ASX:WCL) continues drilling operations in its Bowen Basin coal seam gas (CSG) exploration tenements. WestSide Corporation Limited (ASX:WCL) today moved a step closer to completing the acquisition of a 51 per cent interest in the Dawson coal seam gas (CSG) fields in Queensland&apos;s Bowen Basin after receiving advice that the Foreign Investment Review Board (FIRB) has no objections to the transaction. WestSide Corporation Limited (ASX:WCL) has re-commenced drilling operations in its Bowen Basin coal seam gas (CSG) exploration tenements following recent wet weather across the region. A total of nine wells are currently planned across ATP 688P and ATP7 69P. Further wells are planned, dependant on results from the initial wells in the program. 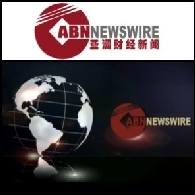 ABN Newswire stocks to watch include: Atlas Iron Limited (ASX:AGO), Marion Energy Limited (ASX:MAE) (PINK:MAEJF), Exco Resources Limited (ASX:EXS) (PINK:EXRSF), WestSide Corporation Limited (ASX:WCL), AuDAX Resources Limited (ASX:ADX) (PINK:ADXRF), Magnetic Resources Limited (ASX:MAU), iSOFT Group Limited (ASX:ISF), Victory West Moly Limited (ASX:VWM), Adelaide Energy Limited (ASX:ADE) (PINK:ADEZF) and Pan Asia Corporation Limited (ASX:PZC). WestSide Corporation Limited (ASX:WCL) has attracted two new cornerstone investors to underpin a A$64.4 million funding package which will cover the acquisition and development of Anglo American&apos;s 51 per cent interest in the producing Dawson CSG fields in Queensland&apos;s Bowen Basin. ABN Newswire stocks to watch include: Havilah Resources NL (ASX:HAV), Dynasty Metals Australia Limited (ASX:DMA), iSOFT Group Limited (ASX:ISF), WestSide Corporation Limited (ASX:WCL) and Universal Resources Limited (ASX:URL). WestSide Corporation Limited (ASX:WCL) expects to re-commence drilling operations in its Bowen Basin coal seam gas (CSG) exploration tenements following recent wet weather across the region. ABN Newswire stocks to watch today include: Galaxy Resources Limited (ASX:GXY) (PINK:GALXF), Conquest Mining Limited (ASX:CQT) (PINK:CQMLF), Australian Bauxite Limited (ASX:ABZ), Benitec Limited (ASX:BLT) (PINK:BNIKF), AusTex Oil Limited (ASX:AOK) (PINK:ATXDF), Bandanna Energy Limited (ASX:BND), WestSide Corporation Limited (ASX:WCL) and Texon Petroleum Ltd (ASX:TXN). Plans by WestSide Corporation Limited (ASX:WCL) to join Mitsui E&P Australia Pty Ltd to acquire the Dawson Seamgas coal seam gas (CSG) assets in Queensland&apos;s Bowen Basin from Anglo American (OTC:AAUKY) and Mitsui Moura Investment Pty Ltd ("MMI") have been unaffected by subsequent pre-emption notices relating to neighbouring permits. WestSide Corporation Limited (ASX:WCL) will join with Mitsui E&P Australia Pty Ltd ("MEPAU") to acquire the Dawson Seamgas coal seam gas (CSG) assets in Queensland&apos;s Bowen Basin from existing owners Anglo American ("Anglo") and Mitsui Moura Investment Pty Ltd ("MMI"). Your Directors present their report on the Consolidated Entity (referred to hereafter as the Group) consisting of WestSide Corporation Limited (ASX:WCL) Half Yearly Accounts and the entities it controlled at the end of, or during, the half-year ended 31 December 2009. ABN Newswire stocks to watch today include: WestSide Corporation Limited (ASX:WCL), Texon Petroleum Limited (ASX:TXN), Pan Asia Corporation Ltd (ASX:PZC), Anglo Australian Resources NL (ASX:AAR) (PINK:AAURF), Benitec Limited (ASX:BLT) (PINK:BNIKF) and CityView Corporation Limited (ASX:CVI) (OTC:CTVWF). WestSide Corporation Limited (ASX:WCL) is pleased to provide the Quarterly Activities Report for the period ended 31 December 2009. WestSide Corporation Limited&apos;s (ASX:WCL) MSM #3 well in the promising Mount Saint Martin (MSM) prospect in ATP 688P has intersected additional coal seams that could significantly increase the Company&apos;s coal seam gas (CSG) resource in the area. WestSide Corporation Limited (ASX:WCL) today announced that it has entered a conditional agreement to acquire Anglo American&apos;s ("Anglo") stake in the Dawson Seamgas coal seam gas ("CSG") assets, and potentially, Mitsui Moura Investment Pty Ltd&apos;s ("Mitsui") interest in those assets. 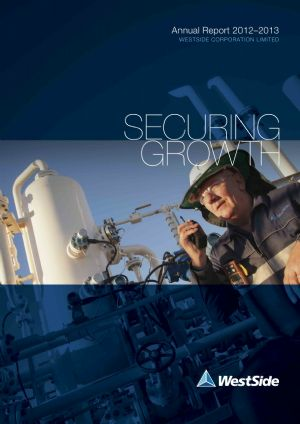 WestSide Corporation Limited (ASX:WCL) has significantly increased the coal seam gas (CSG) reserves targets for the Company&apos;s 2009 / 2010 program after recent results from its drilling and appraisal works provided confidence for the expanded campaign. WestSide Corporation Limited (ASX:WCL) Chairman Angus Karoll address at Annual General Meeting. 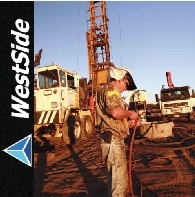 WestSide Corporation Limited (ASX:WCL) provides a drilling report and current activity update. WestSide Corporation Limited (ASX:WCL) has commenced an expanded drilling program in its Bowen Basin tenements which could see 16 new wells drilled by mid-2010. The program aims to build on WestSide&apos;s initial gas reserves. WestSide Corporation Limited (ASX:WCL) continues a multi well program in ATP 688P in the northern Bowen Basin to confirm coal in the P seam and Goonyella seams of the Moranbah Coal Measures in preparation for the drilling of two sets of horizontal chevron-style dual-lateral wells (Tilbrook #L9a and #L9b, Tilbrook #L10a and #L10b) which are planned to intersect with new vertical wells (Tilbrook #9 and #10). WestSide Corporation Limited (ASX:WCL) has commenced a multi well program in ATP 688P in the northern Bowen Basin. The first three wells of the program (Tilbrook #9a, #10a and #10b) are exploration wells to confirm coal in the P seam and Goonyella seams of the Moranbah Coal Measures in preparation for the drilling of two sets of horizontal chevron-style dual-lateral wells (Tilbrook #L9a and #L9b, Tilbrook #L10a and #L10b) which are planned to intersect with new vertical wells (Tilbrook #9 and #10). 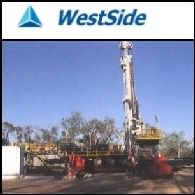 WestSide Corporation Limited (ASX:WCL) has kicked-off the second stage of its 2009 coal seam gas (CSG) drilling program using a newly-commissioned, state-of-the-art drilling rig. The Schramm TXD rig today spud the Tilbrook #9a exploration well. WestSide Corporation Limited (ASX:WCL) is pleased to report that gas and water flows from its Tilbrook #8 horizontal coal seam gas (CSG) well are ahead of expectation. Gas is now flowing at 240,000 standard cubic feet per day* (scfd) and increasing daily with a steady water rate of 400 barrels/day. AUDIO: Westside Corporation Limited (ASX:WCL) has interests in coal seam gas or CSG projects in Queensland and Indonesia. Yesterday the company announced the major acquisition of two exploration tenements in the north west of Queensland&apos;s booming Gallilee Basin covering more than 14,000 square kilometres and believed to contain up to 21 Trillion feet of gas. WestSide Corporation Limited (ASX:WCL) will secure a significant foothold in Queensland&apos;s coal-rich Galilee Basin under an agreement to acquire two petroleum exploration tenements. The Company will target Coal Seam Gas (CSG) at the two pending exploration tenements, ATP 974P and ATP 978P, which cover a combined area of 14,480 km2 in the north-western part of the Galilee Basin. 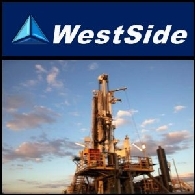 WestSide Corporation Limited (ASX:WCL) today announced the expansion of its 2009 coal seam gas (CSG) exploration program, with up to 16 new holes now planned to be drilled in the Company&apos;s two Bowen Basin tenements. The program also has the option for five more wells in early 2010. WestSide Corporation Limited (ASX:WCL) Quarterly Activities Report For June 2009 will build on its initial certification of gas reserves at the Paranui and Tilbrook coal seam gas (CSG) projects in Queensland&apos;s Bowen Basin over coming months. Further drilling in the Mount Saint Martin and Tilbrook precincts of ATP 688P is planned following promising results from the recent core wells. WestSide Corporation Limited (ASX:WCL) will build on its initial certification of gas reserves at the Paranui and Tilbrook coal seam gas (CSG) projects in Queensland&apos;s Bowen Basin over coming months. Further drilling in the Mount Saint Martin and Tilbrook precincts of ATP 688P is planned following promising results from the recent core wells. It is likely that new lateral wells will be drilled at the Tilbrook pilot once production testing of the Tilbrook #8 horizontal well confirms the success of that well design. 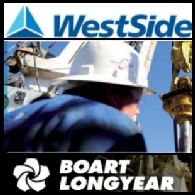 WestSide Corporation Limited (ASX:WCL) has appointed experienced international drilling company, Boart Longyear (ASX:BLY)(PINK:BOARF) to operate, maintain and manage the new Schramm TXD &apos;Telemast&apos; drilling rig currently being commissioned by WestSide in Brisbane. WestSide Corporation Limited (ASX:WCL) is pleased to announce the certification of its first coal seam gas (CSG) reserves at its Tilbrook and Paranui pilots in Queensland&apos;s Bowen Basin.